All parents fear childhood diseases. Every child will fall victim to an illness at one time or another during childhood. Being aware of common childhood ailments, their symptoms, and their treatments prepares parents for the inevitable. Below is a summary of nine common childhood diseases. Chicken Pox is a virus that causes red, itchy blister-like bumps all over the body. The virus usually starts with a moderate fever and cold symptoms. The period of incubation is between 10 to 20 days following exposure to the disease. As chicken pox is very contagious, children should be kept away from other children and adults who have never had the virus until the pox scabs have fallen off. Chicken pox symptoms can be treated with anti-itch lotions to improve comfort. In severe cases, an antiviral medication may be prescribed. Once a person contracts the chicken pox virus, a lifelong immunity usually is developed. For this reason, chicken pox tends to be a childhood disease. There is a chicken pox vaccine that is widely administered within the United States. Croup is a childhood disease that usually affects children between the ages of 3 months and 5 years. It is usually caused by a virus and is characterized by a cough that resembles a seal-like bark. Often croup is accompanied by cold symptoms and fever. Croup usually occurs in the winter months or early spring. In most cases, croup can be treated at home with symptoms lasting about five days. Symptoms are often worse at night. Croup is usually treated with lots of fluids, acetaminophen for chest pain and fever, and mist therapy. Cough medicines are generally not recommended. Fifth disease is a childhood illness with mild to moderate symptoms caused by the parvovirus B19. The illness is characterized by a facial rash that makes the patient look like his cheeks have been slapped. The rash often spreads to the trunk and limbs, where it resembles lace. Some children experience a mild fever and cold-like symptoms for a couple of days before the breakout of the rash. Fifth disease often is mild enough to go unnoticed. Children who contract fifth disease are usually only contagious before the outbreak of the rash. Symptoms usually require no treatment and last from seven to ten days. Hand, Foot and Mouth disease is a common childhood disease usually caused by the coxsackievirus A16. The illness is marked by mouth sores, a rash on the palms of the hands and bottom of the feet, and fever. The incubation period is usually three to seven days following exposure. Symptoms of the illness are decreased appetite, fever, sore throat, sores in the mouth that may blister, flat or raised bumps on the feet and hands, and possibly a rash on the buttocks. The rash usually does not itch. Symptoms diminish in about one week. There is no treatment for the virus; parents can treat symptoms with acetaminophen and plenty of fluids. Mumps is a childhood virus that generally infects the parotid salivary glands as well as other parts of the body. The parotid salivary glands, which produce mouth saliva, are located at the back of the cheeks between the ears and jaw and swell to produce the classic 'chipmunk' appearance characterizing the mumps. Symptoms of the mumps virus are usually moderate to high fever, pain and swelling in the parotid salivary glands, loss of appetite, and headache. Swallowing and eating solids is often very painful. In rare cases, the virus can cause swelling in other body organs like the brain, testicles or ovaries, and pancreas. Mumps have become very rare since the wide use of the vaccine was developed in the late 1960's. Measles is a highly infectious childhood virus that usually occurs in late winter or spring. Symptoms of measles are fever, cough, runny nose, conjunctivitis, and rash. The rash usually appears on the face and neck and spreads over the entire body over the course of one to three days. A patient can usually infect others with the disease for up to four days before the rash appears and for four days after its appearance. Before the widespread use of the measles vaccine, about 450 measles-related deaths were reported each year in the U.S. The deaths were usually caused by complications like pneumonia and swelling of the brain. 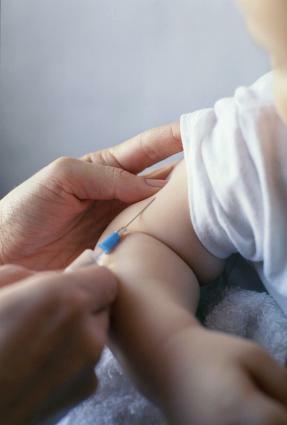 Since the vaccine was introduced, measles outbreaks have been reduced by 99%. These are only a few of the most common diseases children are likely to contract or be vaccinated against. For more information about common childhood illnesses and vaccinations, visit the American Academy of Pediatrics website.